The roads out here in Arizona can be a lot more hazardous than what some individuals may think. Especially as the roads get hotter and put the pressure on your car or vehicle tires, this increases the chances of having a flat tire. Let's be honest. Getting a flat tire is NOT fun. It actually is an absolute nightmare to have happen in the summer time. So what do you do? How do you get your flat tire fixed? Well if your savvy enough you have to unhook your spare and get tow work. Unfortunately most people are not able to do this task. Especially since most vehicles tire lug bolts are extremely tight and hard to twist off. Tow Tempe is here for the rescue. We do hundreds of tire changes every year and know how to to it as quickly and safely as possible to we can get you on your way. If you don't have a spare tire, don't worry either. We can tow you to the nearest tire shop so they can take care of your flat tire promptly. Once again we are flat tire towing experts and we know how to do the job right with our expert tire technicians in Tempe and we promise to be the most affordable tire change in Tempe as well. Yep. 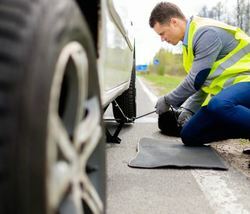 Having your tire go flat on you is what we consider an emergency for sure. Especially if it creates any kind of accident. We realize that with a flat tire your usually stuck on the side of the road somewhere or even worse on the freeway. We know how daunting this can seem especially if you don't know how to change your cars tire or needs some assistance changing you car tire in Tempe or anywhere else in the eastern valley. We promise your a fast and effective tire change to get you on your way. WE even use our own tire jack and can lift the vehicle and quickly swap out the damaged flat tire immediately. Yes, trust Tow Tempe for all your Emergency Tire Repair needs. After flat tires happen we usually like to educate our clients on proper tire care. The biggest fault of the customer usually tends to be low threaded tires. When customer procrastinate changing their wore down tires, this increases the risk of having a flat tire while driving on the roads. This can be extremely dangerous and is not worth the risk. If you notice your tire threads are really low, make sure your replace them immediately!! We also recommend that every once in a while you inspect your tires for any foreign objects that may be penetrated in the tires themselves. WE come across a ton of tires that have nails and objects in the tires that cause accidents. We want to make sure you and your loved ones are safe at all times and tire precautions are a must. We also recommend doing weekly air checks on your tires to check the proper PSI. If your not familiar with PSI it means Pounds Per Square Inch. Every tire type has different PSI rates. If you unsure of your cars PSI type its usually printed on the side of the tire. Make sure you pick up a PSI checker if you don't have one at do weekly checks on your tires PSI limits. This will insure you and your family are safe with the correct tire pressure and air. Make sure you fill it up with air or if you don't have an air pump to stop by a gas station or car dealership to have that taken car of. As stated above, you want to replace your car, truck or motorcycle tires as soon as you see the thread at less than 1/4 of an inch. Proper tire care is critical for the safety of your loved ones. Make sure you checking your tire threads and for any wear every week to ensure you don't get in accidents and have to have a tow truck assist you in Tempe. If your questioning your tire threads or just need help knowing in person feel free to stop by our shop and we will take a look for you. *Tow Tempe operates under the business name KJR Towing.